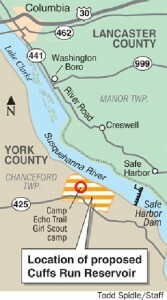 Over a decade after citizen outcry halted a proposed hydroelectric facility on Cuffs Run, another company believed the scenic Cuffs Run natural area, located off the Mason Dixon Trail on the western shore of the Susquehanna, was ripe for the plucking. Like the public outcry 10 years ago, Spring 2011 proved that citizens remain opposed to a wasteful and inappropriate energy project in their backyards. Among other impacts, the proposed facility would have put historic farmlands and homesteads, Native American archeological sites, and a Girl Scout camp underwater, not to mention the lack of economic benefits for local communities. Lower Susquehanna RIVERKEEPER® coordinated a vast letter-writing campaign, public opposition at township meetings, and submitted technical comments against this new hydroelectric project which led to scrapping the project! The company stated on the record that, in the face of such strong grassroots opposition, the project did not meet the appropriate consensus to continue.